1,846 SQ FT ON OVERSIZED LOT IN MESA ONLY $289,000! 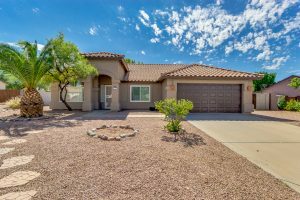 Truly impressive 4 bed, 2 bath home in Mesa is now available for you! This amazing single level home provides a desert front landscaping, RV gate, vaulted ceilings, and designer paint tones throughout. Bright and open kitchen is complete with ample cabinetry, sparkling clean appliances, track lighting, granite countertops, and centered island with breakfast bar. Inside the genuine master bedroom you will find a walk-in closet, and full bath with dual sinks, soaking tub, and step-in shower. Huge backyard includes a covered patio and lots of space to make it your own. This is the one you have been waiting for.